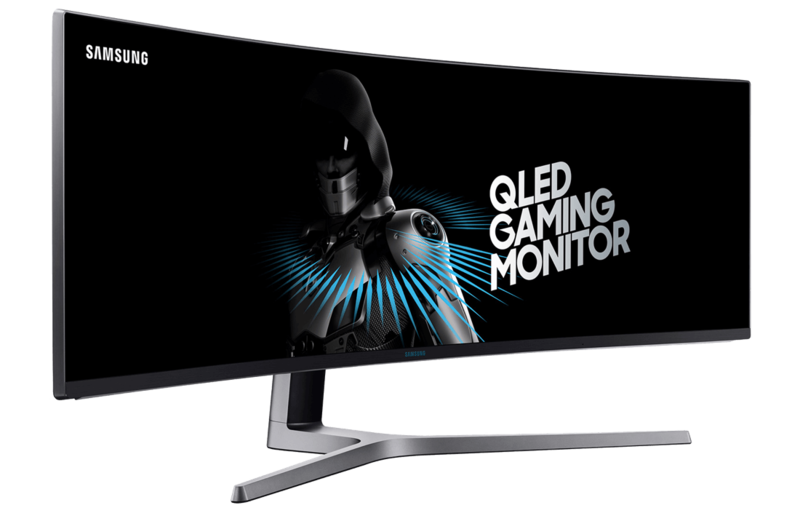 Samsung is updating its curved gaming monitor lineup with new 27, 31.5 and 49-inch versions. All three monitors come equipped with HDR (high dynamic range) for increased light range, quantum dot LEDs that cover 125% of the sRGB color space and 95 percent of the DCI-P3 color space, as well as AMD FreeSync 2 technology for smooth frame rates and avoiding screen tearing. Samsung says quantum dot LED technology showcases games exactly as developers intended, dramatically improving picture quality and gameplay with crisper colors and sharper contrast. While it doesn't have the same perfect contrast of OLED pixels that produce their own light, it has other advantages like better brightness and a TN-panel-level 1-millisecond pixel response time. The monitors also have 144Hz refresh but with IPS-quality color gamut and viewing angles. All three monitors have stands with adjustable height, pivot and angle, along with a similar array of connectivity options — including DisplayPort, two HDMI, three USB 3.0 ports and a 3.5mm audio jack. The 27- and 32-inch models are Quad HD (2,560 x 1,440), while the 49-inch model features an unusual widescreen UHD (3,840 x 1,080) display and has an extra mini-Display Port. The massive CHG90 is built for gaming and since its actually two traditional 1920 x 1080, 16:9 displays mashed together, it shouldn't require a super computer to game on it. That said, keep in mind not all games may actually support its wild 32:9 aspect ratio. On the productivity front it essentially eliminates the need for a dual monitor setup. Samsung has some proprietary software designed to help better take advantage of the screen real estate, by splitting the screen in a number of different layouts allowing users to configure up to six windows at once. All three displays are available to preorder today, and expected to ship later this summer. The 49-inch CHG90 will set you back $1,499, while the 32-inch model costs $699 and the 27-inch variant is $599.